Background: In 1918 the Slovenes joined the Serbs and Croats in forming a new nation, renamed Yugoslavia in 1929. 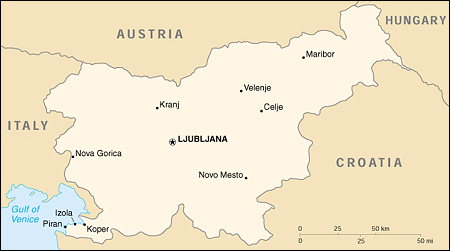 After World War II, Slovenia became a republic of the renewed Yugoslavia, which though communist, distanced itself from Moscow’s rule. Dissatisfied with the exercise of power of the majority Serbs, the Slovenes succeeded in establishing their independence in 1991. Historical ties to Western Europe, a strong economy, and a stable democracy make Slovenia a leading candidate for future membership in the EU and NATO. Economy – overview: Although Slovenia enjoys one of the highest GDPs per capita among the transition economies of Central Europe, it needs to speed up the privatization process and the dismantling of restrictions on foreign investment. About 45% of the economy remains in state hands, and the level of foreign direct investment inflows as a percent of GDP is the lowest in the region. Analysts are predicting between 4.0% and 4.2% growth for 2001. Export growth is expected to slow in 2001 and 2002 as EU markets soften. Inflation rose from 6.1% to 8.9% in 2000 and remains a matter of concern.